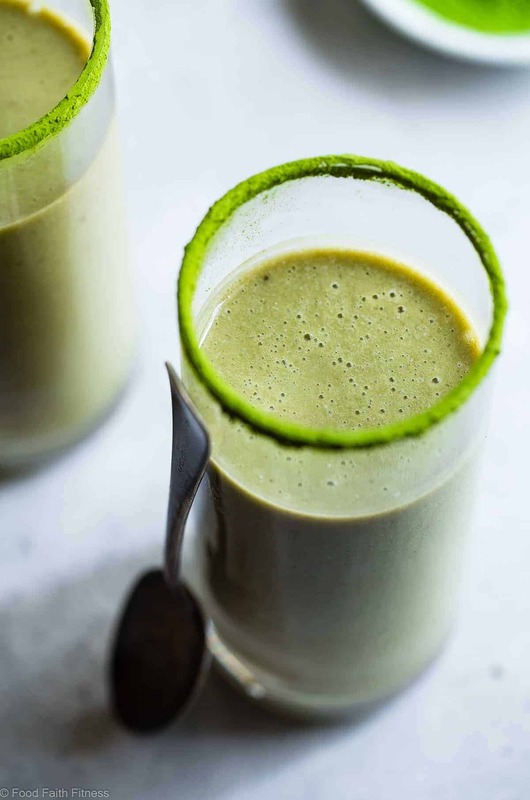 This 3 ingredient Vegan Banana Matcha Smoothie is a simple, healthy breakfast or snack that will give you energy! Gluten free, vegan, paleo and whole30 friendly too! Just kidding. That’s not me AT ALL. I told you in the orange carrot smoothie with ginger that smoothies are pretty much the bane of my existence. Which sounds, like, RLY RLY intense, harsh and OVERLY-DRAMATIC. But, do you really expect anything else from me? Anyway. It’s not that I don’t LIKE smoothies it’s partially because 1. I prefer a big old bowl of cookie dough overnight oats or a stack of healthy gluten free paleo sweet potato pancakes for breakfast, because I like to CHEW instead of sip. But, really, mostly because 2. 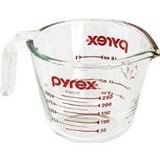 I can’t get ratios right. I’ll make you an epic paleo crepe cake with eleventy billion DELICATE LAYERS that takes me 400 hours (always exaggerating over here) to assemble. But my under-5-minutes-3-ingredient smoothie? WATERY. 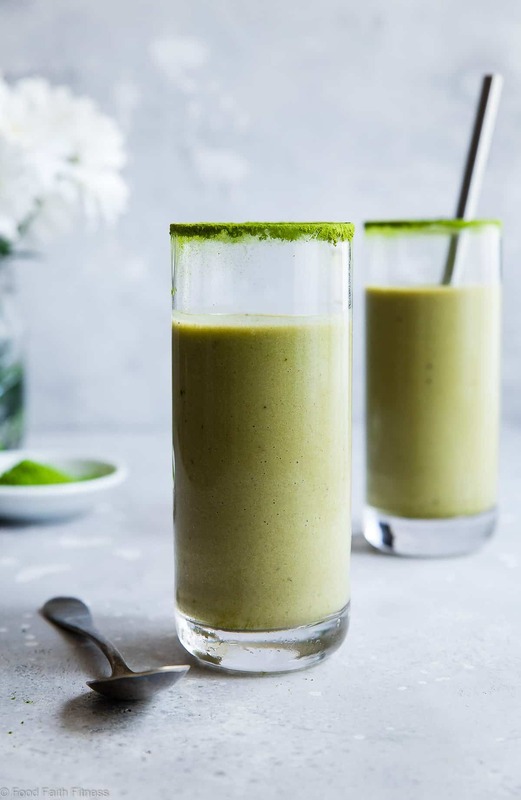 So, like aforementioned carrot smoothie, Mr. FFF jumped in and saved YOUR LIFE (because ain’t nobody want a runny matcha green tea smoothie) and made you T-H-I-S dairy free smoothie! Matcha though. It’s SUPER trendy right now. <– Basically, what cauliflower was to 2017 and what kale was to 2016. <–, the sequel, You KNOW it’s true. 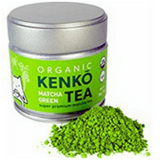 What are the benefits of Matcha Tea? High in antioxidants! This means it’ll help give you GLOWING, youthful skin AND ward off some sickness! Some of these antioxidants can help prevent CANCER! Increased energy, concentration and memory. <–Who does NOT want this? Metabolism BOOST. Sign you up? Me too. 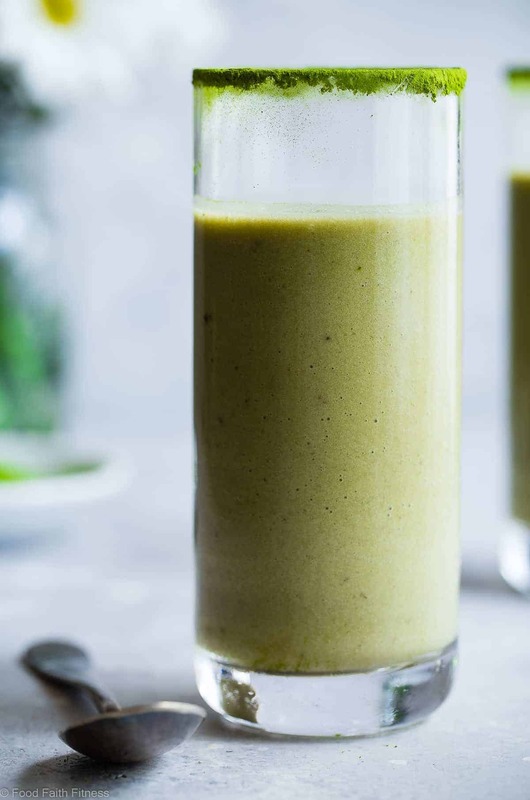 Annnnnd now you’re already running to the kitchen, blender IN HAND, to make this smoothie. Wait. Why do you keep your blender beside your computer? You don’t have to answer that. I’ll just let you do you. Still confused about you though. 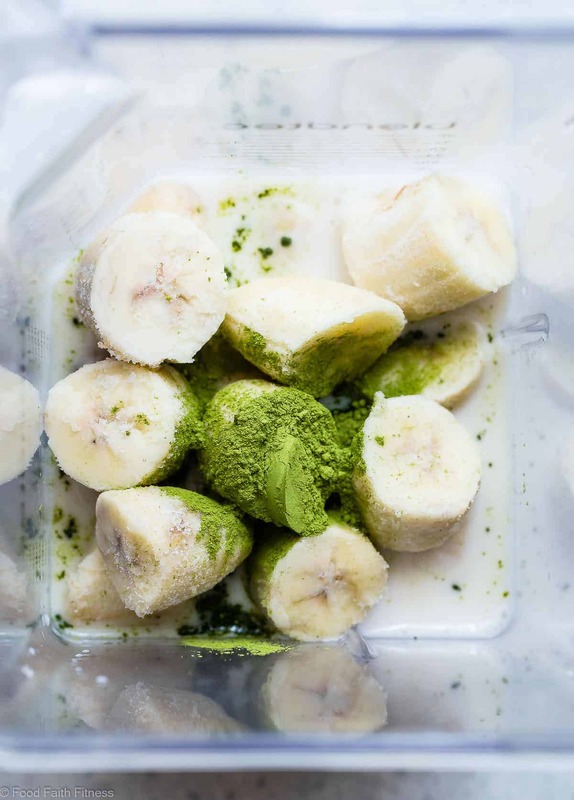 How do you use matcha powder? 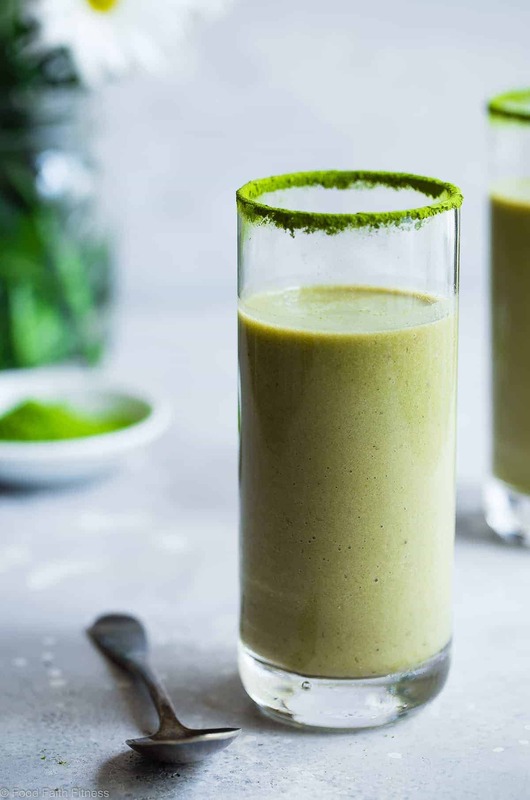 Well, you can obviously use matcha green tea powder in smoothies! You can also add it into snacks like vegan no bake date energy protein balls, or even your favorite cookie recipe! I also love drinking it just mixed with water, a pinch of stevia and apple cider vinegar first thing in the morning! <– This TOTALLY gets my digestion started in the day. I notice a BIG difference without it. SIDE NOTE: a little goes a LONG way. So don’t get matcha crazy. Unless you like your food tasting like grass. You don’t like this. Telling you now. What flavors go well with matcha? Strawberries or raspberries. Something about the sweet fruit/earthy matcha is just LIKE WHOA SO GOODDDDD. Back to you though. Still wondering why your blender is by your computer. Literally only 3 ingredients and totally SUGAR FREE. Using bananas in smoothies is a secret sugar-free weapon AND it makes them HIGH LEVEL creamy-dreamy and ALMOST milkshake-y. 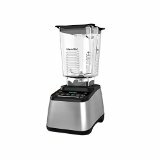 No matter what kind of weird placed you keep your blender, you’re only a HADNFUL of minutes way from ENERGY! CLAIRTY! FOCUS! That’s what it’s ALWAYS gonna come down to. Place all ingredients in a high powered blender and blend until smooth and creamy! STAY IN DA KNOW ABOUT BEHIND-THE-SCENES INFO GOING ON AT FFF BY KEEPING IN TOUCH ON TWITTER, FACEBOOKAND PINTEREST! Best way to start a Monday!! So glad you think so! So much to love about this wholesome drink! Okay, now THIS is a smoothie. Such great flavors! I LOVE matcha nice cream! Such a sweet and creamy bowl of heaven. Add peanut butter and cacao powder, and you got heaven. This is truly a wonderfully simple and nutritious recipe! I absolutely love it! I NEED to try that! YUMMMMM! Making this for breakfast! Such a great list of ingredients. Such a great flavor, perfect breakfast! Nothing better than a satisfying blender drink for on the go snack or meal supplement! Thank you! 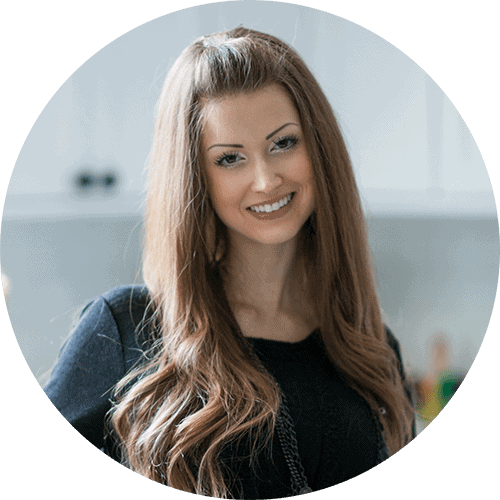 Please email me at taylor@foodfaithfitness.com and we can talk details! 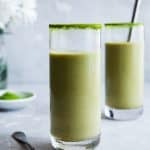 Does this need to be made with a specific matcha powder? Seattle Dweller. Lover of health and fitness, a follower of Christ, recipe developer, photographer and obsessed with cookie dough, pink & leopard print.